Portable Canteens - Full UK Coverage. Standard temporary canteens units come in 10ft or 20ft lengths and are supplied thoughout the UK. Complete with sink, water heater, a work surface and tables and chairs at no extra cost. We can supply steel anti-vandal units or lighter jackleg units - whatever your heart (or site foreman) desires. If your floorspace is limited we can stack the units and being as we're so nice we'll even supply and erect a staircase as well. Need other units? 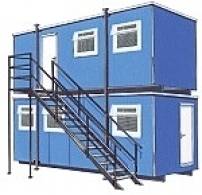 No problem - we can supply offices, storage units and toilet blocks. Just call us free on 0800 408 1484 and we'll take some details and provide you with a free written quotation.